We specialize in vintage 4x4’s and have over 100 in stock! Pinzgauers, Unimogs, Defenders, Broncos, Land Cruisers, International Scouts, Jeep Willys, Nissan Patrols, Ford Truck 4x4s, Chevy Truck 4x4s, NAPCOs, etc. You name it. Visit our website. -Factory 304 V8. Engine has nice Schneider Cam, Aluminum Manifold, Edelbrock four bbl. carburetor, accel coil, fender well headers with dual FlowMaster exhaust. Runs excellent and sounds even better! -Transmission has been upgraded to a full syncro 4-speed trans and updated transfer case. -Top is in good shape and functional. Doors included. -Custom rear bumper with slide-unhitch. -Custom stereo / radio with removable speakers (Not hooked up). -Diamond plating gas tank skid plate. -New upholstery including front seats, back seat and dash pad. Bump the key and go. Runs strong and sounds great. Turns a lot of heads. One Cool classic Jeep!!! OWN THIS VINTAGE JEEP AT A FRACTION OF THE BUILD COST. THE COST OF PARTS AND RESTORATION OF THESE VEHICLES ARE INCREASING DAILY. THEY ARE NOT MAKING ANY MORE AND, THEREFORE, THEY ARE BECOMING MORE RARE BY THE DAY. BUY ONE DONE AND ENSURE YOUR INVESTMENT FOR THE FUTURE. 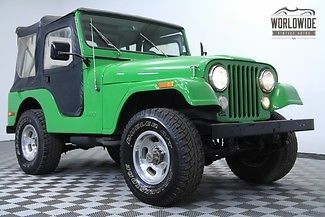 DOING A RESTORATION PROJECT ON A CJ5 LIKE THIS WOULD COST OVER $15,000 NOT INCLUDING THE VEHICLE ITSELF. DON'T DO THE WORK YOURSELF, GET ONE FINISHED FOR HALF OF THE COST OF BUILDING IT YOURSELF. AN EXCELLENT INVESTMENT AND SOMETHING YOU CAN ENJOY DAILY. COLLECTIBLE VINTAGE VEHICLES HAVE HISTORICALLY APPRECIATED AT A RATE GREATER THAN THE STOCK MARKET, GOLD AND OTHER ARTS & COLLECTIBLES AS DOCUMENTED BY MANY ARTICLES AND AUCTION RESULT TRACKING. ALTHOUGH NOT A "NO RESERVE" AUCTION, THE RESERVE PRICE OF THIS VEHICLE IS WELL BELOW COMPARABLE VEHICLES IN THE MARKET. WE RESERVE THE RIGHT TO STOP THIS AUCTION AT ANY TIME. -THERE ARE A COUPLE CHIPS IN THE PAINT. SEE DETAILED PICTURES. -TIRE TREAD IS APPROXIMATELY 35%. -SOFT TOP HAS A FEW IMPERFECTIONS. SEE DETAILED PICTURES.